The Jewellery Editor meets with Jade Jagger in her New Bond Street showroom to discuss all things Jade and jewellery. Maria Doulton: Imagine how I felt when I found out that I had the chance to talk to Jade Jager about her jewellery collections. Together we chose some pieces that Jade thought would best suit me. Here I am styled by Jade and I have got this Chrysoprase ring on, as well as this beautiful sapphire and Polki diamond necklace, and earrings that almost match. That's the jewellery editor styled by Jade Jager. Jade, you've been designing jewellery; tell me, where does this passion for jewels come from? Jade: I have been designing jewellery for 20 years now. It originated, really, with my love of art and a relationship with gold and making my own paint out of pigments, such as lapis. Slowly, from that, I realised that I wanted to use those techniques to create something even more decorative. So I transported them from decorate art and painting into jewellery. Maria Doulton: I see in your latest collection that there is a feel of India about them. Jade: There is definitely a collection there that is inspired by Jaipur and is an ongoing inspiration from the classic work that comes from the workshops that I use there. I think there are also other pieces that are completely inspired more by geometry or architecture. Or the earrings that are the octagons with the trillion-cut diamonds. I think there are maybe two sides to me that do exist, and also trying to combine them. I think it's just about wanting to embellish things and using the right product at the right time. I think Polki diamonds are great because you get a great splash of diamonds. Jade: That is a Chrysoprase ring from my Pope collection. Just a lovely big piece of stone that I think is gorgeous. I love seeing the lustre of a large piece of precious stone with a rough cut diamond on the top. I started off, as well as art, using sculpture. I think you often see quite a sculptural effect coming through in my jewellery. Maria Doulton: If you want to see more of Jade Jagger's jewellery, as well as to buy pieces, they are all on the website; 1stdibs.com. 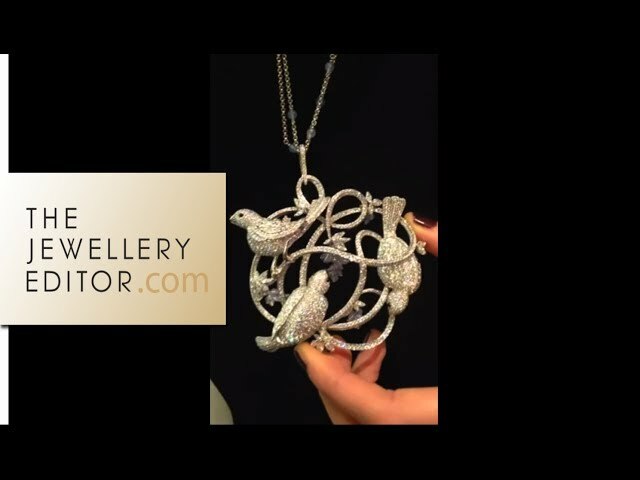 If you want to know all that's happening in the world of jewellery and watches, visit my website; thejewelleryeditor.com.